So you have a son or daughter that are in that awkward age group? You know, the preadolescent group? Too old for dolls, but too young for boys. The age beginning around 5th grade and extending through 8th grade? 10-14..and I may be pushing the 14, but want to include it. [Tween] is the time when puberty is around the corner or is already bashing in the door? This is the age of rapid social development both emotionally as well as physically. Your child may ‘know it all’, but may still want to hold your hand, have a snuggle followed by the next second wanting to just be left alone. Let’s face it, these years are strange for your child and for you as a parent. Unfortunately, this [Tween] group is widely forgotten about by many parents photography wise. You capture the cute years from kindergarten through to fourth and maybe fifth grade with the school photographer. Typically your child will change rapidly in the way they look during their elementary years. Middle school age children change a great deal from 6-8th grades, but these are the awkward stages. The not so (sometimes) photographic your child will be in their lifetime and just the year book photo or iphone pictures are all you have invested in for these years. Maybe your child hasn’t grown into their lanky arms and legs or rather large feet? They have braces, glasses and are trying to figure out where they fit in! But don’t you want to celebrate this stage? There’s proof that they will outgrow this awkward stage, but let’s celebrate it. Don’t forget about your [Tween]! Scheduling them for a photography session can capture who they are during these awkward years of life and actually give them a confidence boost!! Looking back, you will be glad you took the time to photograph them! Before you know it, you are deep into SAT, ACT, AP, college searching and prom. It’s just around the corner from the [Tween] stage and believe me, this time flies. Capture these years…The Wonder Years…the [Tween] years. When it comes to Dr. Who, Batman and Bowties, Hayden takes the cake! Hayden has a love for theatre and plans to attend college in the Big Apple close by to Broadway! Planning this senior portrait session was a bit like planning a Marvel Comic! Hayden’s mom gave me lots of information about him regarding his likes and dislikes and it wasn’t long before we had a colorful, personality driven plan for where we should hold his session! And besides, what’s not to love about a little creativity to make the most of your final year in high school? By the way, these pictures are just a snapshot of what Hayden’s amazing coffee table book contained for his mom! On the hunt for a senior portrait photographer? 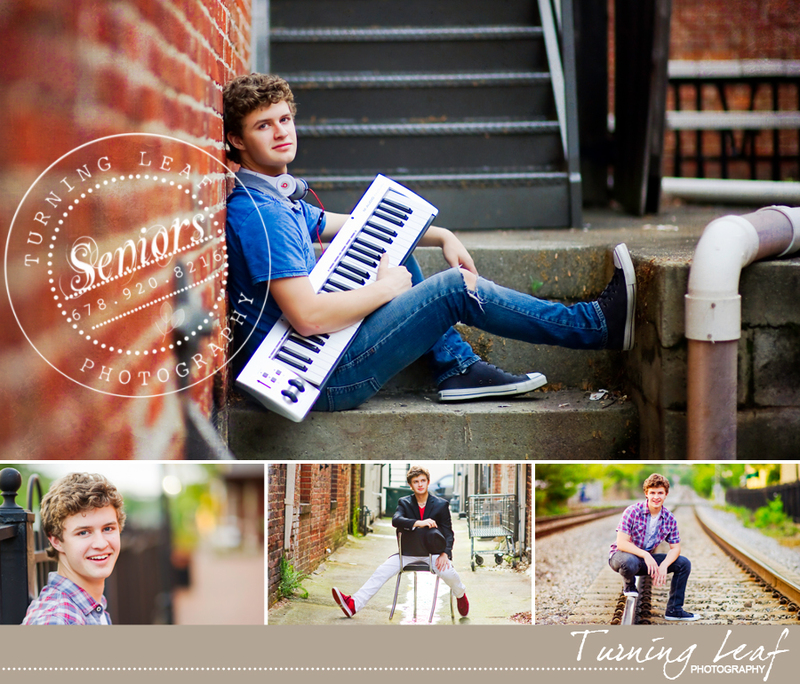 Check out Turning Leaf Photography and see what we have to offer for high school senior pictures! Be sure to read our reviews as well on Google and Kudzu! Prom, Homecoming, Eighth Grade Dance and Military Ball Shopping [Complete list of prom dress shops and reviews in the Atlanta area]! Have set out on the never ending sea of dress and formal wear shopping? Are you unsure where to shop in the Atlanta, Georgia metro area for the perfect prom dress, military ball gown, homecoming dance or eighth grade dance dress? I will be honest, each time I searched for “prom dress shops near me”, I wasn’t sure which direction to drive with my daughter! I found there wasn’t a great list or advice in one location about where to shop for party dresses and what the dress shops offered. Really, I don’t think anyone wants to spend weekend after weekend dress shopping for any event, so you want to make the most of your time when you do shop! With a little planning and my dress shopping guide below based on my own personal visits, I hope you will enjoy the experience! After visiting many of the prom, homecoming and military ball dress shops and stores in the Atlanta metro area, including Atlanta, Roswell, Marietta and Kennesaw, I hope you find this detailed information including reviews of the shops useful when you are on your own hunt for the perfect dress! Want to shop online? Follow the links below! Check out these links for more help about different dress styles that will work with your figure! 2) Be sure to SET a budget for yourself and when dress shopping. Dresses range in price from an on sale price of $35 and all the way to over $700. Do not try on dresses outside of your budget or you will really be in “never, never trying on dress land” and only become disappointed! Typically speaking, the more rhinestones and embellishments on the dress, the more expensive it will be! Check out this budget guide for examples of what dress styles will range in price wise. 3) Take a pair of heeled shoes with you, equal to about the height you’d like to wear. This will help you when trying on your dress. I didn’t see any girls doing this. 4) Dresses can run small, be prepared to go up one size from what you normally wear! 5) Think about your hair when choosing a dress…! How will you wear it and feel comfortable? Up or down? 6) Finally, looking for a complete prom guide so you don’t forget any details from limosine rental to the boutineer? Check out the link below! http://www.promgirl.com/prom-guide/costs and check out this fun prom guide! All-in-all, I found most dress shops have their dresses broken down first by size, second by color, third by length and finally how full they are. All of the shorter dresses are typically hung together. More formal and evening gowns are hung together and then fuller gowns are sometimes hung together all by size. Some stores have dresses by color like glittery rainbow of party dresses (which is fun to me if they have so many dresses that they can do this!). We visited this store on a weekend day around lunch and it was rather busy. All of their party dresses are on the right of the store as you walk in. Bravura is located in a very trendy and upscale shopping center near Merchants Walk in Marietta. There wasn’t a huge selection here though, in my opinion. Their prices seemed on the steeper side with most near the upper $700 range. I believe this store has a very “specific selection” that they like to carry with designers. I didn’t get far enough into the process about how the attendants helped with the dresses or how many attendants helped or what the process was for their dresses. There were girls trying on dresses and purchasing. The shopping center is located by Menchies, which was a plus!! This location was another we visited on the weekend around lunch time. It’s an easy visit from here Bridals by Lori as well as Lenox, Phipps Plaza and Perimeter Mall. There was a fairly good selection of dresses in my opinion. They are very picky here about only allowing the attendant to zip and unzip your dress. They were friendly, but stern…however this wouldn’t steer me away from a visit to the store as they are only being careful with their dresses. Their prices were very fair, with most being around $300-$400. I saw four dressing rooms and they had two attendants helping. This is the location for filming “Say Yes to the Dress”. We didn’t know until we were there though and they have three levels. Prom attire is on the bottom level. Upon visiting this store we realized that they require you to sign in and fill out an info card so they can record you into their system. You will then wait to be called back to to look at and select dresses. At first we weren’t too happy about this and worried they’d rope us into a ‘sales pitch’. But we found it to be great in a lot of ways, because if they are busy you have your own personal dressing room and they limit the number of girls viewing dresses at one time in the actual ‘dress shop’. No one was pushy…just for the record. We visited on the weekend during the early afternoon and waited about 30 minutes before taking our turn. They were pretty busy and under-staffed they said. They have a good selection of larger sized dresses are here from what I could see; not as many smaller sizes. They have a great 3-way mirror, if you get that far with a dress you’ve tried on. There were girls buying dresses and they had a fair amount of ‘on sale’ dresses as well; their pricing seemed fair from $99 sale dresses all the way up to $700’s. We didn’t have a ‘personal attendant’ here, but it appeared some of the girls did? This location is nearby to Lenox, Phipps and Perimeter mall, so a trip here can be combined with other stores. This store has a large variety of dresses in colors and styles. The store is rather cramped with SO many dresses, but it’s well organized once you dig in by size and color. There was a wait to try dresses on and the store was bustling at the late afternoon hour. They were fairly accommodating and friendly when we walked in and explained how their sizes were situated on the racks throughout the store. Their prices seemed fair to me with the top price tag around $600, but most around $300. They also had a rather large sale rack with some unique dresses! Being located by Town Center Mall, makes visiting them an easy day trip with other stores in the area of Kennesaw and Town Center Mall. Upon visiting this store we also found they require you to sign in and wait your turn upon arrival. The wait wasn’t long at all during the week/early afternoon hours, but several girls were trying on dresses at the same time and each had a personal attendant helping them. They had several dressing rooms and I could see this store being very busy during the weekend! There are LOTS of colors here with a good selection of short, long and full dresses all the way around. There seemed to be a great variety of smaller and larger sizes here with plenty in between sizes too. They register your dress with your school name. The attendant we had was helpful and friendly, she would make suggestions if you wanted her to. They have a nice selection of shoes as well. They are by Town Center Mall, which makes visiting them an easy day trip with other stores in the area of Kennesaw. From visiting this store on a weekday evening, they were not that busy. Their prom dresses are located on the left hand side of the store as you walk in. There is a decent selection of dresses here with fair prices and they are by Town Center Mall making them a great visit and easy day trip with other stores in the area of Kennesaw. From visiting this store on a weekday evening, they were busy and bustling just before close; but it’s a small location. I did like the energy here. This was formerly a house now turned formal wear shop. The prom dresses are on the right side of the store. The attendant helping us was friendly, helpful and made suggestions. My daughter found a good contender of a dress here suggested by her that she wouldn’t have otherwise considered. They provide you with four rings to slip on the dress hanger, then they take the dress to your dressing room for you. They want to handle the dress as well as zip and unzip you and were very accommodating and helpful in this regard with the handling of dresses. They have layaway; they will check their registry against your school list as well. They have a ‘prom club’ you can join for a discount. They are not too far from Town Center Mall, which makes visiting them an easy day trip with other stores in the area of Kennesaw. This store is located inside Town Center Mall in Kennesaw, GA nearby JCPenney. They had a very large selection of very beautiful dresses on the rack as well as on display. They were busy. Their range was mostly around $500. I did see two dressing rooms and an attendant ready to help girls with their selections. Macy’s has a nice selection of lower priced dresses on two levels! Be sure to look in juniors as well as women’s sections. Their pricing was $200 and under. We’ve found an 8th grade dance dress here before that was super cute and I would say they had dresses to fit this type dance when we visited! Your on your own with a dressing room. JCPenney has shocked me before since we have found a home coming dress at this location before. This year, not so much selection, which was a disappointment. They had a rather small grouping of dresses in their selection. Their prices were $200 and below for the most part. Your on your own with a dressing room. I would say they had a few dresses that could work for an 8th grade dance! We have been lucky at Belk as well, each store location varies and this one had a pretty decent selection of dresses that were reasonably priced at $200 and under. Your on your own with a dressing room. They had a few dresses that could work for 8th grade dance! Nothing here at all for formal wear. Very slim options here and basic selection of dresses each time we’ve been. The pricing is reasonable at around $200, but you’d be lucky to find something here other the so many options around! This location was where we’ve found a military ball dress that we loved and was reasonably priced. This year, there wasn’t alot of selection with only a few racks to choose from. Again, the pricing is reasonable at around $200. This is mostly a bridal store, but they had a beautiful Cinderella prom dress advertisement in the window which made us think they would have a variety of prom dresses, so we stopped in. They only had a few dresses here and it was not worth the stop. It could have been a great store for prom though, so we were disappointed. My daughter had to have several military ball dresses throughout the last few years and with so many balls, I couldn’t spend a fortune each time a dance came around! We ordered from Jen Jen House a few times and have found their sizing to be true and their quality to be good to great. We did order one dress in white and the two whites seemed not to match equally but we were ok with it in the end. We cannot complain about them because of the prices!!! The Jen Jen site allows you to break out searches by dress length, color and style which is great! You will find dresses for $250 and under. Just calculate in shipping direct from China! Allow time for the shop to ‘make the dress to your specifications’, time for shipping and also time for any alterations if necessary upon arrival. Again, I would recommend them for evening dresses, prom and especially for a military ball as well as for an eighth grade dance when shopping on a very strict budget. This is where you will most likely find the dress you are searching for by designer…! Just ordered from here personally, searching by designer that we couldn’t find locally. So will update when I have more information. Hands down, our favorite for classy and inexpensive accessories for prom, military ball and homecoming dances. I would say Charming Charlie is more suited to high school age – adult. The stores are by color and can be overwhelming to the senses! They carry a great line of elegant earrings, necklaces, bracelets, clutches, headbands and hair pins to complete your look. I believe you can also find what you would like at Claire’s without a problem, though the store can be more appealing to the younger crowd. Icing has a large variety as well, just like Claire’s and tends to be more trendy. By far, shoes have been somewhat of a hurdle for us next to finding the perfect dress. Obviously, you want your dress before purchasing your shoes. Girls tend to kick their shoes off and they end up in the corner at the dance…so first impressions are where the shoes come into play! Check the major mall store chains like Macy’s, Belk, JCPenney, etc. Shii had a great selection at one time, but recently does not seem to have the right shoes for prom, homecoming and military balls – so I don’t consider them anymore. If all else fails, check Payless Shoe Source as they will have a selection of shoes and clutches that will work. Stores I have not visited but may be good contenders! Senior portraits for guys too! Guys, I understand that most of the girls have senior portraits. But we cannot forget your senior portraits?! If you are looking for a senior portrait photographer to help achieve what you want in your senior pictures, check out the Turning Leaf Photography Website for more information! For the third year running solid, I am proud to say I was voted Best Family Photographer in Atlanta, Ga for the year 2014. This is an amazing honor and I am thankful for all of the amazing clients through the years that have loved me and voted me as the best photographer in the Atlanta market! Thank you, thank you! Please read more from my amazing clients at the Kudzu link! and visit the website for more of my work!